Yes, kitesurfing is easy! After just a handful of lessons by a good instructor, you will be up and riding! It is such a fun, adrenalin-filled sport that you won’t mind the learning curve as you will be having so much fun. During your lessons you will learn all about the safety and will soon realise that this is actually a very safe sport. The accidents you hear about are mostly from people who were using extremely old kites or people who didn’t go for lessons. It is so much fun it becomes addictive and it will be all you think about and all you want to do! It is so easy that there are 5 year olds out there doing it, so what are you waiting for?! You don’t need to be very fit or strong to start kitesurfing, but it will definitely make you fit and strong! You will get toned without even realising it! Getting an all over body workout while having fun, now that’s my kind of sport! The kitesurfing community is a friendly one. Once you start learning you will already start meeting all sorts of new people. You will realise that kitesurfers are a welcoming, fun and often crazy bunch! They are supportive more than they are competitive. You can’t help but get to know them as you borrow each other’s kite pump, help each other out in the water, launch each other’s kites, discuss the conditions and which kite size to take out and when there’s no wind, get together and complain about how there’s no wind! 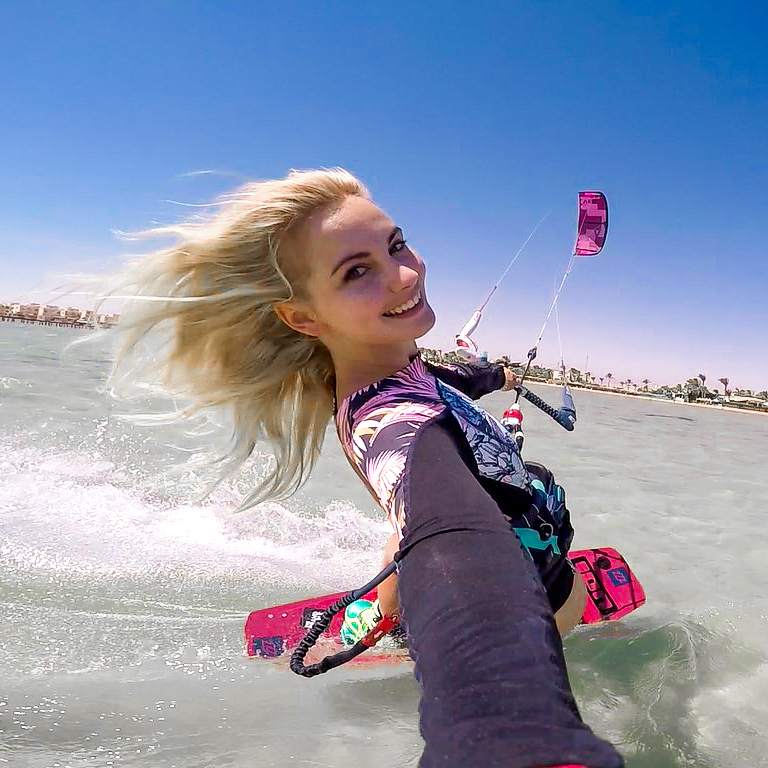 It’s all part of the Kitesurfer to Kitesurfer bonding experience – and you will love it! One very good reason to start kitesurfing is that it takes you outdoors into the fresh air. You get to experience nature at its finest. You get to have some sun on your skin and bare feet in the sand. Just looking at the sea automatically makes one feel calm and relaxed. Your body and mind recharges. This makes kitesurfing a tremendously healthy sport. And then when you get home, you can sit on the couch eating junk food and binge-watching Netflix without feeling guilty, because you’ve had your outside time for the day! Since kitesurfing is so addictive, you will want to do it on all your holidays! And this means finding new and exciting places all over the world. Beautiful, family friendly places or more desolate adventurous places – you will be surprised at how many kitesurfing spots there are all around the world! Whether you enjoy riding waves or cruising along flat water, light or strong wind, there is holiday destination for you! And if you prefer holidays in the snow, you can try your hand at some snow kiting. And you can easily travel with your gear and often at no extra cost, so that’s not a problem. Without even trying too hard, you will find yourself with a vast knowledge of the weather. You will quickly learn to judge how many knots the wind is blowing just by looking out at the sea or the sand. You will start noticing things like the movement of the clouds and shifting of the sand banks. You will check your tide clock more often than your regular clock. You will constantly check the wind report and surprise yourself at how you understand everything. Most importantly, you will learn to judge whether the conditions are ideal for yourself to have a good session or if they are too dangerous for you to be on the water. Kitesurfing itself is always changing and progressing for the better. The kites are changing to suit every riders needs and the technology behind the gear is constantly progressing. New ways to do the sport are always appearing. You can ride waves or flat water in many different ways and you can ride different types of boards in different ways. You can go extreme or relaxed; there are so many options! You as a rider will also change and progress. You will learn something new every session that leads you to progress into a better rider. Well, you become like a superhero. You learn to jump and fly high up in the air. You learn to turn and twist without even thinking about it. Your senses become enhanced. Your coordination and mind-body connection becomes reinforced. And no matter how advanced you are, you always feel like a superhero when you are doing it. Kitesurfing is without a doubt one of the coolest extreme sports out there. Just telling someone you are a Kitesurfer ups your cool factor by at least 50%. Even more if you can show people cool photos of yourself out on the water. It’s that overwhelming stoke you feel after a session; any session, good or bad. That feeling that you’ve been out in the elements. There’s something about that salt on your skin and sun in your eyes that makes you feel alive. And there’s something about those aching muscles that makes you feel like you’ve done something great with your day. It’s the feeling of smiling from ear to ear. You get a new feeling of gratefulness over your life and the fact that you can move and jump and fly. It’s the humility of knowing you are but a small drop in the vast ocean. It’s all those feeling bunched up into one. THAT feeling is why you should start kitesurfing.